The outcome of steroid-dependent or frequently relapsing nephrotic syndrome of minimal change disease (MCD), mesangial proliferative GN (MesGN), or FSGS may be poor and with major treatment toxicity. This academic, multicenter, off-on trial (ClinicalTrials.gov #NCT00981838) primarily evaluated the effects of rituximab therapy followed by immunosuppression withdrawal on disease recurrence in 10 children and 20 adults with MCD/MesGN (n=22) or FSGS who had suffered ≥2 recurrences over the previous year and were in steroid-induced remission for ≥1 month. Participants received one dose (n=28) or two doses of rituximab (375 mg/m2 intravenously). At 1 year, all patients were in remission: 18 were treatment-free and 15 never relapsed. Compared with the year before rituximab treatment, total relapses decreased from 88 to 22 and the per-patient median number of relapses decreased from 2.5 (interquartile range [IQR], 2–4) to 0.5 (IQR, 0–1; P<0.001) during 1 year of follow-up. 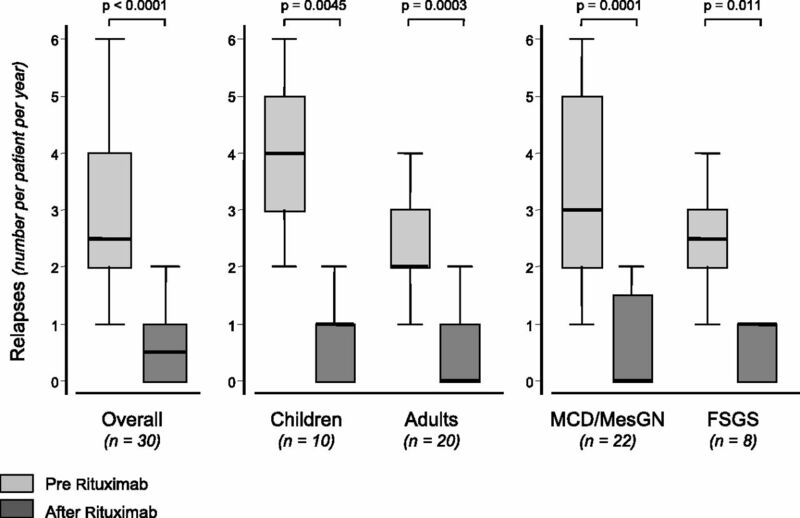 Reduction was significant across subgroups (children, adults, MCD/MesGN, and FSGS; P<0.01). After rituximab, the per-patient steroid maintenance median dose decreased from 0.27 mg/kg (IQR, 0.19–0.60) to 0 mg/kg (IQR, 0–0.23) (P<0.001), and the median cumulative dose to achieve relapse remission decreased from 19.5 mg/kg (IQR, 13.0–29.2) to 0.5 mg/kg (IQR, 0–9.4) (P<0.001). Furthermore, the mean estimated GFR increased from 111.3±25.7 to 121.8±29.2 ml/min per 1.73 m2 (P=0.01), with the largest increases in children and in FSGS subgroups. The mean height z score slope stabilized in children (P<0.01). Treatment was well tolerated. Rituximab effectively and safely prevented recurrences and reduced the need for immunosuppression in steroid-dependent or frequently relapsing nephrotic syndrome, and halted disease-associated growth deficit in children. Independent of the underlying renal pathology, prednisone continues to be the cornerstone treatment at disease onset, achieving remission within 4 weeks in approximately 90% of children with MCD and in 20%–60% of those with FSGS.4,5 However, 60%–70% of patients relapse after steroid tapering or withdrawal, and most require repeat courses of prednisone to achieve remission of recurrent episodes and/or the addition of other immunosuppressive medications, such as calcineurin inhibitors, mycophenolate mofetil, or alkylating agents, to reduce the number of relapses and prevent major side effects of steroid treatment.6 According to their relapse rate, these patients are classically labeled as “steroid-dependent” or “frequently relapsing”. In these patients, serious adverse effects of treatment associate with complications of relapsing episodes of heavy proteinuria. These are the patients in most urgent need of more effective and safer treatment. The possibility of a specific and, hopefully, safer approach to patients with steroid-dependent or frequently relapsing NS emerged in 2004 when the B cell–depleting mAb rituximab was reported to induce remission of proteinuria in a child with frequently relapsing NS secondary to MCD who had received this medication to cure a supervened idiopathic thrombocytopenic purpura.7 Subsequent uncontrolled observations found some effect of rituximab in patients with steroid-dependent or frequently relapsing MCD,8–11 suggesting that B-cell immunity could play a key role in the pathophysiology of the disease. Controlled studies in support of this hypothesis, however, have been both scanty and almost confined to children12,13 or to patients with MCD who were evaluated in the context of a retrospective, observational design.14 Indeed, less attention was given to adults and patients with FSGS given difficulties in designing adequately powered trials. Overall, 32 of 44 screened patients fulfilled the selection criteria and consented to study participation (Figure 1). Two patients withdrew their consent before rituximab administration. Thus, 30 patients received one (n=28) or two (n=2) 375 mg/m2 rituximab infusions from April 2009 to January 2011. They had been receiving chronic therapy with steroids and/or other immunosuppressants over a median of 8.5 years (interquartile range [IQR], 4.6–15.4) and 3.9 years (IQR, 1.2–6.6), respectively. Study flow chart. Of 44 screened patients, 32 fulfill the selection criteria and 30 consent to study participation. Of them, 14 never relapse despite completed withdrawal of steroid and any other immunosuppressant. All patients were Caucasian, with the exception of one Indian participant. Of treated patients, 10 were children (<18 years old) and 20 were adults. All children were steroid-dependent and 5 adults were frequently relapsing; 19 patients were diagnosed with MCD, 3 with MesGN, and 8 with FSGS. Patients with MCD and MesGN were considered in the same diagnosis group (Table 1). Median duration of the disease (8.5 years; IQR, 4.6–15.4 years) tended to be longer in adults and in patients with FSGS compared with children and those with MCD/MesGN. At inclusion, all patients were in complete (n=28) or partial (n=2) remission from their NS. Serum albumin and total proteins were consistently in the normal range in all considered groups (Table 2). Most participants tended to be overweight and dyslipidemic, and most children showed features of hypercorticism. Children were small for age; according to the Tanner criteria,17 one child was growth retarded. One participant was prepubertal at the age of 19 years. Eight children and 11 adults were taking BP-lowering therapy with one or more medications (Table 3). 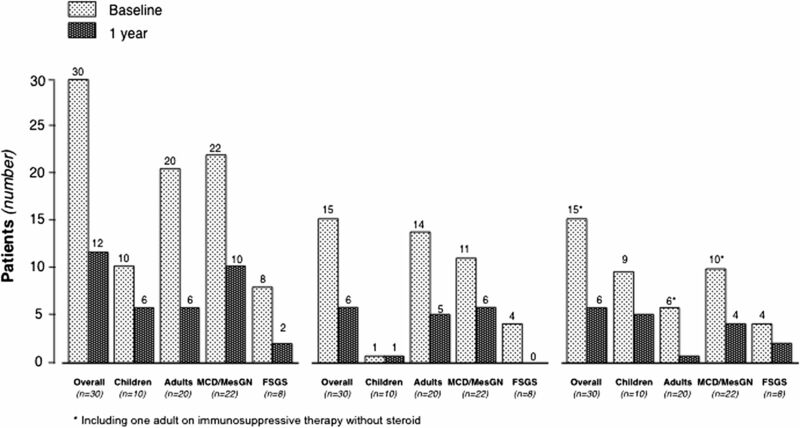 All patients had been treated with steroids in the past (Table 1). In addition, 25 patients, including all 10 children, had received at least one course of immunosuppressive steroid-sparing agents. In particular, 18, 17, and 11 patients had also received one or more courses of calcineurin inhibitors or antiproliferative or cytotoxic drugs, respectively. Two patients had been also treated with levamisole and one with adrenocorticotropic hormone. At the time of rituximab administration, 29, 10, and 13 patients were taking concomitant steroids, calcineurin inhibitors, or antiproliferative agents, respectively. Six and eight patients were receiving combined treatment with two or three medications, including steroids. All patients receiving triple therapy were children (Table 3). Overall, we observed 110 relapses: 88 before and 22 after rituximab administration (Figure 2). In four patients, NS relapsed shortly (3, 5, 7, and 16 days, respectively) after rituximab administration, when circulating B cells were still fully depleted. The per-patient median number of events decreased from 2.5 (IQR, 2–4) before rituximab administration to 0.5 (IQR, 0–1) after rituximab administration. Among patients with 2, 3, or more relapses over the year before rituximab administration, the number of events over the year after rituximab administration decreased to 0 (IQR, 0–1), 1 (IQR, 0–1), and 1 (IQR, 1–2) with a relative event number reduction of 100% (IQR, 50%–100%), 66.7% (IQR, 66.7%–100%), and 75% (IQR, 71.4%–80%), respectively. This 5-fold reduction was highly significant (P<0.001) in the study group as a whole as well as in children and adults or MCD/MesGN and FSGS patients considered separately (Figure 2), even when the last recurrence immediately preceding rituximab administration was not considered (P<0.001). Box plot of the number of NS relapses over 1 year of follow-up after rituximab administration, and during the year before rituximab administration in the study group as a whole (overall), and in different age (children versus adults) and diagnosis (MCD/MesGN versus FSGS) subgroups considered separately. Only 15 of the 30 study patients had one or more relapses over 1 year after rituximab therapy, whereas all of them had had at least two relapses during the year before rituximab therapy (P<0.001). Thus, after rituximab administration, 15 patients were persistently relapse-free throughout the whole observation period. At the study end, 14 of these patients were fully off steroids and any other concomitant immunosuppressive medication (Figure 1). Relapses after rituximab therapy were observed in 7 of 10 children (70%) compared with 8 of 20 adults (40%), as well as in 12 of 22 patients with MCD/MesGN (54.5%) compared with 3 of 8 patients with FSGS (37.5%). The trend toward more relapses in children and in MCD/MesGN patients after rituximab administration paralleled the higher incidence of events observed in both subgroups before rituximab administration (Figure 2). The median time to the first event (7.5 months; IQR, 0.5–10.7; Figure 3, upper panel) did not differ appreciably among subgroups (Figure 3, middle and lower panels) as well as between patients with or without childhood disease onset (Supplemental Figure 1). Time to NS relapse was similar between age and diagnosis groups. Kaplan–Meier curves showing the proportion of participants progressing to the first NS relapse at different time points over 1 year of follow-up after rituximab administration in the study group as a whole (overall, upper panel) and in different age (children versus adults) and diagnosis (MCD/MesGN versus FSGS) subgroups considered separately (middle and lower panels, respectively). 95% CI, 95% confidence interval; HR, hazard ratio. Younger age at inclusion significantly correlated with a higher number of relapses before rituximab administration (ρ=−0.58; P<0.001). A similar correlation was found between age at disease onset and number of relapses that, however, was only marginally significant (ρ=−0.36, P=0.05). None of the two covariates correlated with the event number after rituximab administration (ρ=−0.30, P=0.11; and ρ=0.30, P=0.11, respectively) or with relative event reduction versus before rituximab administration (ρ=0.22, P=0.24; and ρ=0.31, P=0.09, respectively). We used first-order fractional polynomials to model nonlinear continuous baseline predictors in the Cox analysis. Univariate analysis showed that age at inclusion (P=0.02), age at disease onset (P=0.10), and the event number over the year before rituximab administration considered as a continuous (P<0.05) or dichotomous (P=0.03) variable were significantly associated with the risk of relapse after rituximab administration (Supplemental Table 1). Multivariate analysis showed that age at disease onset retained a significant association with the outcome when adjusted for the previous number of relapses considered either as an ordinal (P=0.04) or dichotomous (P=0.04) variable. With both models, the association of previous relapses with the outcome was borderline significant (Supplemental Table 1). After rituximab administration, children resumed a normal or near normal growth rate that averaged 4.4±2.0 cm over the 1-year follow-up. Consistently, their height significantly increased; combined with the parallel reduction in weight, these results translated into a significant reduction in body mass index at 1 year compared with baseline (Table 2). These anthropometric changes were paralleled by a concomitant increase in estimated GFR at 1 year compared with baseline (Table 2). BP control also remarkably improved on follow-up, whereas other considered parameters did not change appreciably (Table 2). In adults, no considered parameter changed appreciably, with the exception of serum total protein and triglyceride levels, which significantly increased and decreased at 1 year compared with baseline, respectively. In the 11 adults with measured iohexol plasma clearance, the GFR averaged 100.2±29.1 ml/min per 1.73 m2 at 1 year and albumin and sodium fractional clearances (data not shown) did not change appreciably compared with baseline. Time-dependent changes in all considered parameters did not differ appreciably between the two diagnosis groups (Table 2). After rituximab administration, CD19 B lymphocytes were promptly and fully depleted and progressively reemerged into the circulation from month 6 to 1 year (Figure 4). In participants without relapses, the reduction in circulating B cells at different time points versus baseline was significant throughout the whole study period, whereas the difference was not significant any longer from day 240 up to the study end in those patients with relapses. Circulating B cells at the time of rituximab administration (day 0) and at different time points thereafter in participants with or without relapses of NS throughout the 1-year observation period. Up to day 210, B-cell counts are always significantly lower compared with baseline in both groups. From day 240 to day 365 differences were still significant versus baseline in nonrelapsers, but were no longer significant in relapsers. At 1 year, 18 patients (60%) had completed tapering and withdrawal of all immunosuppressive medications (Figure 1, Table 3). Of these patients, 14 (77.8%) had completed treatment withdrawal without any disease recurrence throughout the whole observation period (Figure 1). Thus, at 1 year, only 12 patients were receiving maintenance immunosuppression. Six of these patients were taking a steroid combined with other immunosuppressants compared with 15 patients who were taking combined therapy at baseline (Figure 5, Table 3). Five of the patients taking residual combined therapy were children. Of note, all 10 patients taking calcineurin inhibitors at baseline had withdrawn these medications at 1 year (Table 3). Thus, the number of patients requiring maintenance immunosuppression with steroid alone or in combination with one or two additional immunosuppressive medications remarkably decreased after rituximab administration compared with baseline (Figure 5). Consistently, the per-patient median steroid daily dose significantly decreased from 0.27 mg/kg (IQR, 0.19–0.60) to 0 mg/kg (IQR, 0–0.23) (P<0.001) at 1 year compared with baseline (Figure 6, left panel). The dose significantly decreased from 0.53 mg/kg (IQR, 0.27–0.82) to 0.25 mg/kg (IQR, 0.13–0.45) (P=0.03), even when the comparison was restricted to the 12 patients who were still taking maintenance steroid therapy at 1 year. Cumulative yearly doses of mycophenolate mofetil and cyclosporin A also decreased from 304.5 g (IQR, 140.0–496.5) to 195.0 g (IQR, 112.5–255.0), and from 39.92 g (IQR, 32.76–46.15) to 14.85 g (IQR, 11.55–18.00) (P=0.04 and P=0.01, respectively). Rituximab reduced the need for maintenance immunosuppression. Numbers of patients with any maintenance immunosuppressive therapy (left), or on maintenance therapy with steroid alone (middle), or steroid plus one or two additional immunosuppressive medications (right) at the time of rituximab administration (baseline) and at 1 year after treatment administration. Rituximab allowed to significantly reduce the steroid therapy doses. Box plot of per-patient daily steroid maintenance dose administered to prevent NS recurrences at the time of rituximab administration (baseline) and at 1 year after treatment administration (left), and cumulative steroid dose administered to treat all NS recurrences (middle) and each single NS recurrence (right) observed over 1 year of follow-up after rituximab administration and during the year before rituximab administration. All data are adjusted for patient body weight. All relapses observed over each year before or after rituximab administration were treated with a standardized steroid regimen as per center practice, and no patient was exposed to repeated rituximab courses to prevent or treat recurrences. The median cumulative dose of steroid required to induce remission of all relapses observed over 1 year before and after rituximab administration largely decreased from 56.8 mg/kg (IQR, 34.4–93.7) to 0.5 mg/kg (IQR, 0–18.1) (P<0.001; Figure 6, middle panel). This reduction reflected the reduced number of relapses after rituximab (Figure 2), as well as the concomitant reduction from 19.5 mg/kg (IQR, 13.0–29.2) to 0.5 mg/kg (IQR, 0–9.4) (P<0.001) of the median cumulative dose required to achieve remission of each single relapse (Figure 6, right panel). This reduction, in turn, was partly explained by the reduced median duration of relapses from 15 days (IQR, 14–27) to 11.5 days (IQR, 7–16) (P=0.02). In parallel with tapering and withdrawal of steroid therapy, fewer patients required concomitant therapy with protonic pump inhibitors and other gastroprotective medications at follow-up compared with baseline. No substantial changes in angiotensin converting enzyme inhibitor or angiotensin receptor blocker therapy were introduced during the study (Table 3). No serious treatment-related adverse event was observed during, or shortly after, rituximab infusion. During the observation period, eight serious adverse events were reported in six adults. All events occurred in patients still receiving concomitant therapy with steroid and other immunosuppressive medications, and patients recovered without sequelae (Table 4). No child had serious adverse events. Additional sensitivity analyses considering an extended observation period, ranging from 2 years before rituximab administration to 2 years thereafter, confirmed the event number reduction observed during the core study (Figure 7). The number of events observed during the first year (0.5; IQR, 0–1) and the second year (0; IQR, 0–1) after rituximab both significantly decreased compared with the event number observed during the two 1-year periods before rituximab (1; IQR, 1–3; and 2.5; IQR, 2–4, respectively; P<0.01 for all comparisons between periods before and after rituximab administration). The event reduction observed after rituximab administration was sustained up to 2 years of follow-up. Reduction or withdrawal of steroids after rituximab therapy blunted the increasing growth deficit previously observed in children over 3-year steroid exposure and normalized their growth rate up to the 3-year follow-up. 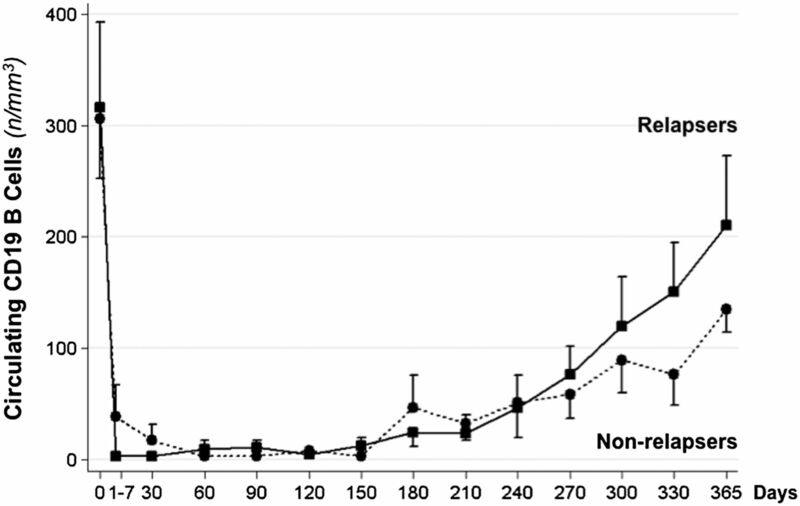 Height z scores (left) and mean height z score slope (right) during the two 3-year observation periods before and after rituximab administration in the 10 children with steroid-dependent NS. *P<0.05 versus month 0; **P<0.01 versus month 0; ○P <0.05 versus −12 months. 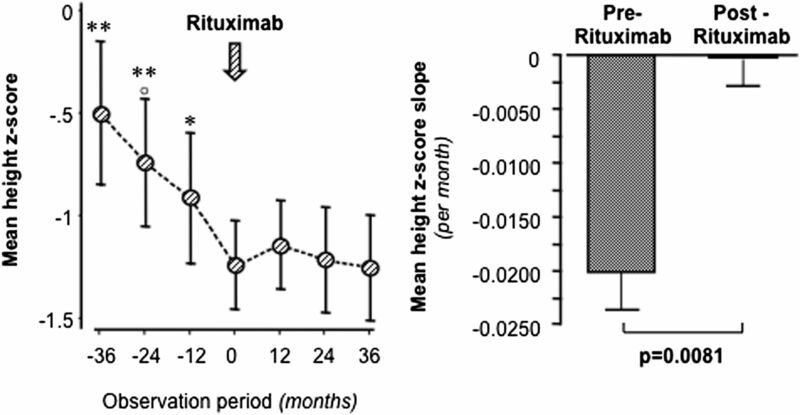 Post hoc analyses considering the children’s height z scores over 3 years before and after rituximab treatment showed a progressively increasing growth deficit over the 3 years preceding rituximab administration, a trend that was fully blunted by rituximab administration that stabilized the height z score over the following 3 years (Figure 7, left panel). Consistently, the mean height z score slope significantly (P<0.01) improved from −0.02±0.004 to −0.001±0.006 per month (Figure 7, right panel). Virtually identical results were obtained when the Δ z score between the height z score and the target height z score was considered (data not shown). The change in Δ z score slope after rituximab administration was significant as well (P<0.01). Of note, no treatment effect was observed in two girls who had progressed to Tanner stage 5 (puberty) at the time of rituximab administration. In this longitudinal, within-patient controlled study, we found that the anti-CD20 mAb rituximab significantly reduced the frequency of relapses in 10 children and 20 adults with steroid-dependent or frequently relapsing NS, and was safe. Over a 1-year observation period, relapses decreased by approximately 5-fold compared with the year preceding rituximab treatment, an effect that was independent of the number of relapses before inclusion and was similar in children compared with adults as well as in patients with MCD or MesGN considered as a whole compared with those with FSGS. Similar results were obtained when the observation period was extended from 2 years before to 2 years after rituximab administration. These additional sensitivity analyses confirmed that study findings were robust and showed that the treatment effect was sustained over time. Of note, at the study end, all participants were in remission and 18 patients were free of any immunosuppressive medication. The finding that 14 of the 18 treatment-free patients never relapsed after rituximab administration, even after complete withdrawal of ongoing immunosuppressive therapy, provided additional evidence of the protective effect of rituximab prophylaxis against disease recurrence. The marked suppression of disease activity was confirmed by the reduced need for maintenance immunosuppression and cumulative steroid dose required achieving remission of recurrences of NS. Notably, the steroid-sparing effect was explained not only by the reduced number of recurrences, but also by the reduced amount of steroid required to achieve remission of each single episode. This was a genuine effect of rituximab, because no specific guideline for diagnosis and treatment of relapses was introduced during the study and the investigators were advised to continue treating recurrences of NS as per center practice. A plausible explanation is that previous prolonged exposure to steroidal drugs resulted in a glucocorticoid resistance mediated by downregulation of glucocorticoid receptor-α and other mechanisms18 that recovered with steroid back-titration and withdrawal after rituximab administration. On the other hand, the same mechanisms underlying the protective effects of rituximab against disease relapses could also limit their severity. Both the reduced exposure to steroid therapy and complete withdrawal of calcineurin inhibitors most likely accounted for the progressive reduction in BP and the amelioration of dyslipidemia and estimated GFR that we observed on follow-up, particularly in children. The finding that rituximab fully blunted the progressively increasing growth deficit observed in children over 3-year steroid exposure and normalized their growth rate up to the 3-year follow-up—with the only exception of two girls who had progressed to Tanner stage 5 and had, therefore, most likely exhausted their residual growth potential—was also a finding of major clinical relevance, because impaired growth is one of the most devastating effects of chronic steroid therapy.19 Conceivably, reduced immunosuppression will reduce the risk of serious side effects in the long term,20 particularly in those individuals progressing to ESRD who eventually receive a kidney transplant requiring further immunosuppressive treatment to prevent rejection21 or to treat post-transplant disease recurrence. On the other hand, the finding that patients with FSGS had the same response to treatment compared with those with MCD or MesGN was particularly intriguing. This would suggest that mechanisms of idiopathic NS are independent of the underlying pathology, possibly reflecting a disease spectrum that includes steroid-dependent MCD, MesGN, and FSGS as different morphologic manifestations of overlapping etiologic factors. Disease remission was associated with prompt, long-lasting depletion of circulating B cells, suggesting that, as previously observed in IMN,16 the treatment effect could be mediated by disruption of autoreactive B lymphocyte clones producing pathogenic Igs. From this perspective, we speculate that the four early recurrences observed within 16 days after rituximab administration were triggered by preformed antibodies released into the circulation before treatment-induced B-cell depletion. Recent evidence that the permeability factor historically advocated to explain the pathogenesis of glomerular barrier dysfunction in idiopathic NS25 could be, or could bind to, an Ig would reconcile the old hypothesis of a key role for this putative factor with the concept based on present data that idiopathic NS could be a B cell–related disorder.26 The pathogenic role of B lymphocytes would also explain why MCD or FSGS may occasionally occur in patients with other B cell–mediated diseases27 and why NS remission achieved by rituximab associates with circulating B-cell depletion.8–14,26 In patients in this study, persistence of remission after B lymphocyte reappearance in the circulation could actually be the result of a complete and definitive disruption of the potential autoreactive clone(s). This is in line with the evidence that in IMN, persistent remission achieved by rituximab therapy is paralleled by depletion of nephritogenic autoantibodies, even after re-emergence of B lymphocytes in the circulation.28 Additional mechanisms, including interference with antigen presentation, expansion of regulatory T cells, or modulation of natural killer cell and macrophage activity, could underlie the efficacy of rituximab in this context.29 Finally, rituximab may directly bind the sphingomyelin phosphodiesterase acid-like 3b protein expressed on the glomerular epithelial cell surface, an effect expected to stabilize the cytoskeleton and prevent apoptosis and eventually restore the physiologic barrier function of the podocyte.30 On the other hand, evidence that rituximab is not uniformly effective in all cases of steroid-dependent or frequently relapsing NS may imply different etiologies in some patients, as well as gene-related factors and, possibly, different susceptibilities of podocytes or podocyte progenitors to injury. Of note, in 28 of 30 study patients, treatment effect was achieved by one single 375 mg/m2 rituximab dose. With the exception of few reports in steroid-dependent MCD,11–13,26 most previous studies tested the standard four weekly 375 mg/m2 dose regimen originally implemented for the treatment of relapsing or refractory non-Hodgkin’s lymphoma,15 a regimen, in several cases, that was followed by additional doses infused in the attempt to achieve some degree of remission after initial treatment failure. However, we reasoned that dysfunctional B-cell mass here is remarkably lower than in B-cell malignancies and that lower doses of rituximab would fully deplete aberrant B-cell clones, as previously observed in 36 IMN patients with long-lasting, persistent NS.16 Consequent advantages included minimized risk of infusional reactions, reduced number of hospitalizations, and savings of >€10,000 (approximately $13,000) per patient. Minimizing patient exposure will also limit the risk of acute reactions secondary to patient sensitization and of rituximab inactivation by drug-specific antibodies, which is instrumental to allow effective retreatment in the case of disease recurrence. This may be of clinical relevance for patients with steroid-dependent or frequently relapsing NS who fail to achieve persistent remission and might, therefore, require repeated, even life-long, courses of rituximab treatment. As previously reported in different clinical settings, rituximab therapy was remarkably safe and well tolerated. No treatment-related serious adverse event was observed during rituximab infusion; on the basis of its long-term safe and tolerable profile,31 no serious side effects are expected in most patients over decades. However, post-treatment surveillance is recommended because serious adverse events such as progressive multifocal leukoencephalopathy have been exceptionally observed even years after exposure in patients with proliferative disorders and individuals who are heavily immunosuppressed.32 Notably, the overall rate of adverse events over the follow-up period was minimal, and no serious event was observed in children, a finding attributable to reduced incidence of relapses on top of reduced exposure to steroids and immunosuppressive therapy. Consistently, no event was observed after completion of treatment withdrawal in the 18 patients who achieved this goal. The major limitation of this study was that treatment was not assigned according to a randomized design. A randomized parallel group study, however, would have required a much larger number of patients to provide the analyses with an adequate power to detect a treatment effect despite wide interpatient variability. Because of the rarity of the disease, particularly of adult and FSGS cases, this approach would have reduced the feasibility of the study. A longitudinal design with intrapatient comparisons in a well characterized population with a documented high rate of disease recurrences remarkably increased the statistical power of the study, which allowed addressing the working hypothesis even in a resource-limited setting. The striking, 5-fold relapse reduction observed shortly after rituximab administration was consistent through all considered subgroups and closely reproduced the treatment effect reported in previous retrospective observational analyses.10 The above findings cannot be explained by a spontaneous trend of the disease to wane over time, a process occasionally observed in some patients over several years and even decades. Any appreciable confounding effect of regression to the mean was excluded by finding that a similar and highly significant treatment effect on the relapse rate was also observed when the observation period was extended over 2 years before and after rituximab treatment and relapse episodes immediately preceding rituximab administration were not considered in comparative analyses. The finding that event reduction was significant despite the theoretical possibility that retrospectively recorded before rituximab relapses could have been underestimated provided additional evidence of the robustness of the results. The power of comparative analyses between different considered subgroups was limited by the small sample size, thus the possibility that treatment effect could be affected by patient age or underlying pathology could not be definitely excluded. Rituximab treatment effectively reduced the incidence of recurrences and the need for either maintenance and induction immunosuppression in patients with steroid-dependent or frequently relapsing idiopathic NS, and allowed patients to maintain sustained remission without any immunosuppression in most cases. Treatment was remarkably safe and well tolerated in all patients. These findings may have major clinical implications, because rituximab therapy might help limit the complications of NS and of concomitant treatments, complications that are often devastating in this clinical context. Our findings may provide the background for future pathophysiology studies to further investigate the mechanisms underlying the effects of rituximab therapy in patients with idiopathic NS and to identify early predictors of response to rituximab therapy in this context. We included patients with steroid-dependent or frequently relapsing NS (see the “definitions” paragraph) secondary to biopsy-proven MCD, MesGN, or FSGS who had suffered at least two recurrences of NS over the last year despite steroid and/or other immunosuppressive therapy, were in steroid-induced partial or complete remission since at least 1 month from the last recurrence, had a creatinine clearance>20 ml/min/1.73 m2, and had no evidence of hepatitis B or C virus infection. Patients were not included if they met any of the following: refractory or persistent NS, genetic mutations associated with intrinsic abnormalities of the glomerular barrier, legal incapacity, intellectual disability/mental retardation, dementia, schizophrenia, and any condition preventing the possibility of providing an informed consent, or with concomitant clinical conditions that could prevent completion of the study or jeopardize data interpretation. Pregnant or lactating women or women with childbearing potential without effective contraception were also excluded. Detailed selection criteria are provided at http://www.clinicaltrials.gov/. Written informed consent was obtained from adult patients or parents of underage patients. This study was approved by the ethics committees of all participating centers. 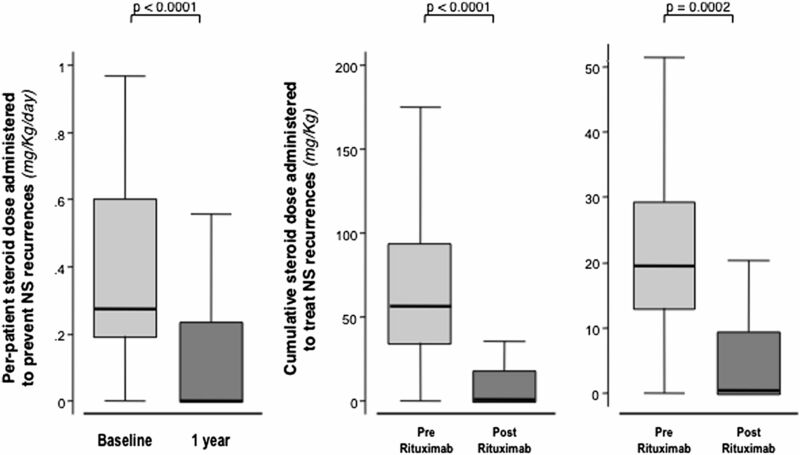 This study primarily aimed to evaluate the incidence of recurrences of NS over 1-year follow-up compared with the incidence observed over the year before rituximab administration. The study also evaluated and compared the amount of steroid and other immunosuppressive medications required to achieve and maintain remission of NS over the year before and after rituximab administration, as well as the effects of treatment back-titration on clinical and laboratory parameters. All outcomes were evaluated in the study group as a whole and in different subgroups considered separately. Finally, the study aimed to evaluate the safety and tolerability of rituximab administration. Additional sensitivity analyses were performed extending the evaluation of relapses over 2 years before and after rituximab administration and changes in height z scores and Δ z scores between height z scores and target height z scores were compared in children over the 3-year observation periods before and after rituximab treatment. Retrospective data before rituximab administration were exhaustively recorded through electronic case report forms by the same doctors who were in charge of patient care in every-day clinical practice, whereas data after rituximab treatment were recorded prospectively. Before rituximab administration, we measured office BP, weight, height, proteinuria in 24-hour urine collections, serum lipids, and routine laboratory parameters. In a subgroup of patients, we also measured the GFR by using the iohexol plasma clearance technique,33 and calculated albumin and Na+ fractional clearances. After per centers practice premedication with steroids and/or antihistaminic agents, 375 mg/m2 of rituximab were intravenously infused through a 0.22-μm in-line filter after reconstitution in normal saline to a final 1 mg/ml concentration. The infusion was started at 1 ml/kg per hour and the rate of infusion was progressively increased up to 4 ml/kg per hour according to drug tolerability. An intensivist attended the start of treatment and was on call throughout the whole duration of the infusion. Circulating B cells were measured 24 hours after rituximab administration. If >5 B cells per mm3 were observed, they were again measured 1 week later. If counts were still >5 B cells per mm3, a second dose of rituximab was administered with the same identical modalities applied during the first infusion. Starting at 1 month after rituximab administration, concomitant immunosuppression was progressively back-titrated over 6–9 months, up to complete treatment withdrawal or recurrence of NS. Recurrences were treated per center’s practice. Per protocol, immunosuppressive medications, including calcineurin inhibitors, mycophenolate mofetil, or alkylating agents, were tapered first in patients receiving dual or triple maintenance therapy. Steroid tapering was started only after all other immunosuppressive medications had been withdrawn. No specific guideline for diagnosis or treatment of NS relapses was introduced during the study and the study centers were advised to continue treating relapsing as per center practice. No change in diet and other therapies, particularly with angiotensin converting enzyme inhibitors or angiotensin II receptor blockers, was systematically introduced throughout the whole study period. Urine was closely tested by Albustix during back-titration of immunosuppressive and steroid therapy and whenever deemed clinically appropriate thereafter. Proteinuria and CD20 or CD19 B cells were measured at monthly visits. All baseline evaluations were repeated at 1 year after rituximab administration (final visit). This study was coordinated and monitored by the Department of Renal Medicine of the IRCCS - Istituto di Ricerche Farmacologiche “Mario Negri,” Clinical Research Center for Rare Diseases “Aldo e Cele Daccò” according to good clinical practice guidelines. Data were locally recorded in dedicated case report forms and then doubly entered in the central database at the Clinical Research Center. The following definitions were used: steroid-dependent NS, relapses invariably observed during steroid tapering or within 2 weeks after steroid discontinuation34; frequently relapsing NS, ≥2 relapses observed over the last 6 months or ≥4 relapses observed over any 12-month period34; complete or partial remission, proteinuria <0.3 g/24 h (<4 mg/h per m2 in children) or <3.5 g/24 h (<40 mg/h per m2 in children), respectively, in at least two consecutive visits; and relapse, recurrence of massive proteinuria (>3.5 g/24 h or >40 mg/h per m2 in children or urine dipstick results ≥2+ on three consecutive days). The main outcome variable considered for sample size estimation was NS recurrence. Per the selection criteria, 100% of study patients were expected to have at least one relapse over 1 year of observation before study inclusion. Assuming that rituximab administration would have reduced the number of patients with at least one recurrence over 1 year of observation by ≥50%, we calculated that the inclusion of 16 patients would have conferred a 90% power to demonstrate a statistically significant reduction (α=0.05, one-tailed test) in the number of patients with recurrences after rituximab administration. To account for a 20% dropout rate, screening of participants had to be continued at least until 20 patients would have been included. Normality for continuous variables was assessed by means of the Q-Q plot. Correlations were performed using Spearman rank correlation coefficient. Relative event number reduction was defined as follows: [(number of relapses before rituximab − number of relapses after rituximab)/number of relapses before rituximab]. Box and whisker plots were used to graph skewed distribution. The data of baseline characteristics were presented as numbers and percentages, means and SDs, or medians and IQRs, as appropriate. Follow-up data were expressed as medians and IQRs and were compared with the Kruskal–Wallis test. The Wilcoxon signed-rank test, McNemar test, and Mann–Whitney test were used for within/between-group comparisons, as appropriate. Changes in the follow-up period of main clinical parameters were tested by means of the repeated-measures analysis using linear intercept or mixed models, adjusted for the baseline value. Estimated GFR was calculated using the Chronic Kidney Disease Epidemiology Collaboration36 study equation for the adults and the Schwartz formula for the children.37 Percentiles and z scores based on the US Centers for Disease Control and Prevention Growth Reference Year 2000 were used to assess anthropometric measures to help evaluate children’s growth. Height Δ z score was defined as the difference between height z score of the period and midparental height z score (target height z score). Changes over the 36-month observation before and after rituximab treatment were tested using linear mixed-effect models and the slopes were compared using paired t test. All P values were two sided. Analyses were carried out using SAS (version 9.1) and Stata (version 12). We thank Dr. Mauro Abbate, who helped design the study and critically revised the manuscript. We are indebted to the staff of the nephrology units of Bergamo Hospital, Bambino Gesù Children’s Hospital, and Aldo e Cele Daccò Clinical Research Center of the Mario Negri Institute for their assistance in the selection of and care for the participants in this study. Dr. Ettore Sabadini and Dr. Alessia Gennarini were in charge of patient care and follow-up, and Dr. Mario Bontempelli studied the lymphocyte subpopulations. Manuela Passera assisted in preparing the manuscript. The Clinical Research Center for Rare Diseases “Aldo e Cele Daccò” of the IRCCS – Istituto di Ricerche Farmacologiche “Mario Negri” (Bergamo, Italy) served as the NEMO study coordinating center. Members of the NEMO Study Organization are as follows: G. Remuzzi, principal investigator (Bergamo, Italy); study coordinator, P. Ruggenenti (Bergamo, Italy); consultant, M. Abbate (Bergamo, Italy). Participating centers and investigators are as follows: G. Remuzzi, P. Ruggenenti, P Cravedi, B. Ruggiero, M. Marasà, S. Prandini, and V. Lecchi (Bergamo, Italy; n=11 participants); F. Emma, L. Massella, M. Vivarelli, B. Ruggiero, P. Picconi, and A. Di Iorio (Rome, Italy; n=11 participants); G. Capasso, A. A. Mele, R. M. Pollastro, and R. Grimaldi (Second University of Naples, Naples, Italy; n=4 participants); A. Pisani, B. Visciano, and G. Pisani (Federico II University, Naples, Italy; n=3 participants); M. Pennesi and S. Pastore (Burlo Garofolo, Trieste, Italy; n=1 participant); and M. Carraro and C. Zennaro (Cattinara, Trieste, Italy). Additional support was provided by the following individuals at the Mario Negri Institute (Ranica, Italy): N. Rubis, O. Diadei, A. Villa, M. Sabatella, and A. Scordari (monitoring and drug distribution); B. Ene-Iordache, S. Carminati, and D. Martinetti (database and data validation); A. Perna and A. Chianca (data analysis); F. Gaspari, F. Carrara, and C. Cella (laboratory measurement); and P. Boccardo and S. Peracchi (regulatory affairs). This was a fully academic study without involvement of pharmaceutical companies. The Agenzia Italiana del Farmaco of the Italian Ministry of Health funded the organization and conduction of the study, but had no role in study design; collection, analysis, and interpretation of data; writing of the report; and decision to submit the paper for publication. Costs of the experimental drug were covered by the involved hospitals. P.R. and B.R. contributed equally to this work. This article contains supplemental material online at http://jasn.asnjournals.org/lookup/suppl/doi:10.1681/ASN.2013030251/-/DCSupplemental.